I wrote last week, following the very disappointing home defeat by Stevenage, that many fans felt that nothing much had changed since last season. Now, following two narrow defeats away from home, they are probably thinking much the same thing. There has been a change in the manner of the three defeats as each game was different in nature but the end product was the same although for different reasons. All three, however, left the impression of “we’ve been here before”. 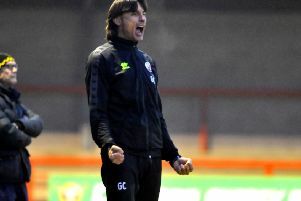 Although Reds had been listless against Stevenage, manager Harry Kewell also expressed some concern that Crawley had received rookie referees in consecutive games. That changed in the Carabao Cup tie at Bristol Rovers that was in the charge of very experienced official Lee Swabey. That didn’t necessarily help Reds’ cause as they were out-muscled in a very physical and tetchy encounter. We were awarded plenty of free-kicks but Mr Swabey seemed disinclined to try and eliminate the home side’s unsporting approach. How many times did we see that last season? It wasn’t a case that we weren’t good enough to eliminate our League One opponents and so arrest our awful run in knockout competitions but we were literally not strong enough. It also took until the second half for Crawley to show real attacking intent. That pattern was not unfamiliar last season but it was not enough to quell enthusiasm for the trip to Port Vale where we enjoyed a fully merited victory last April. Sadly it was time to introduce the third familiarity template. Once again the desired fast start was not evident. The majority of the first half passed somewhat inconsequentially in midfield. Port Vale’s luck was in as Luke Hannant poached a goal following a superb save by Glenn Morris from a drive by Dave Worrall. Crawley’s, in particular Lewis Young’s, luck was out as his shot from a great pass by Filipe Morais clipped the upright on the wrong edge. We hadn’t been great but we had dominated possession and didn’t deserve to be behind. In the second half we upped the tempo and created a string of chances. It seemed like we did everything but score. I’m sure that sounds familiar. Morais and Ollie Palmer suggested they were good acquisitions but even the top clubs need an element of luck on their side. We surged forward in numbers, the Valiants hung on desperately, and we finished without the result that our play had merited. Close but no cigar as they say. Who says we haven’t been there before? The chance to change our luck will came quickly as tomorrow night (Tuesday) we face Swindon Town at Broadfield Stadium. We might have profited as the Robins’ 3-2 defeat of Tranmere Rovers showed both that their defence is porous but also that lady luck is on their side.